Nothing says breakfast like coffee and eggs, right? 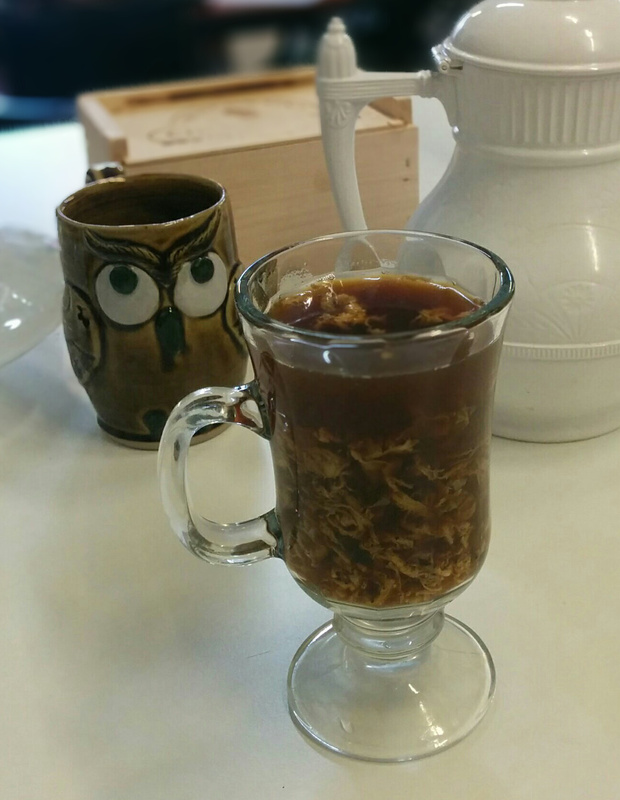 Look at that classy owl mug photobombing the egg drop coffee. Grind coffee beans and put into a cheesecloth bag or similar. Put the bag of coffee grounds in a medium saucepan filled with water and heat on the stove. Beat three eggs (about one egg per serving of coffee) in a small dish with a whisk. Once the coffee is brewed, remove the bag. Gently stir the coffee while drizzling the egg into the coffee. Pour into individual mugs, add cream if desire, and enjoy as best you can! Egg drop coffee and cream. Kristen: I like drinks with texture, like chia seeds in kombucha and that sort of thing, so I thought combining coffee and eggs, two foods I already want to consume, was a very promising idea. 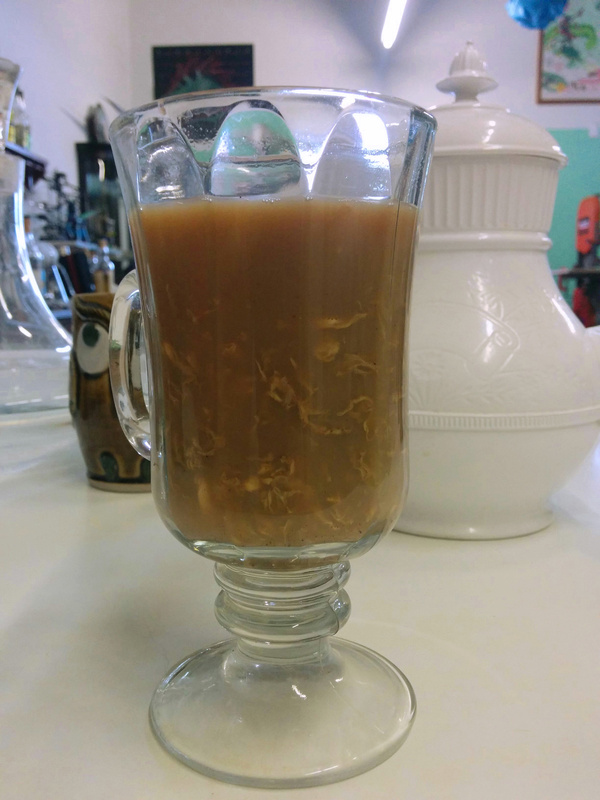 I enjoyed the egg drop coffee at first because the first few sips had just a bit of egg. The coffee entirely masked the taste of the egg, which was a bit unfortunate–maybe it would have been better with tea. However, the egg sank to the bottom of the cup, so I eventually ate what tasted like bitter coffee grounds with a weird texture. We’d need to find a way to thicken the coffee to keep the egg dispersed. “Thickened coffee” sounds unwholesome in its own right, though. Alex: Imagine taking a mouthful of omelette, chewing it thoroughly, taking a sip of coffee, gargling with it, and then holding it all in your mouth. Coffee made with eggs is a tradition in a couple of places, mostly in Scandinavia. They usually include the eggshells too, but strain out the grounds and egg bits.